Today marks Bi Visibility Day, an initiative created to celebrate bisexuality and diversity within the LGBT community. Observed each year on 23 September, Bi Visibility Day is designed to raise awareness about bisexuality and the issues that bisexual people face in their day-to-day lives. Countries including the US, Britain, Australia, Germany, Japan and New Zealand are marking the event. 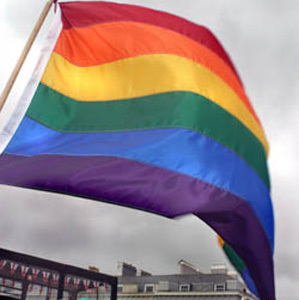 Since 1999, the LGBT community has been encouraged to celebrate the day with dinner parties, talks, film screenings, flag-flying and balloon launches. The day is being marked with events in Brighton, Manchester, London and Swansea. Research published in May by the European Union Agency for Fundamental Rights (FRA) found that bisexual people experience higher levels of discrimination at work than gay men. Bisexual people were also more likely to feel they have to hide their sexual orientation at work than lesbians and gay men. UNISON, one of the UK’s largest trade unions, is marking the day by launching a new fact sheet to help challenge discrimination against bisexual workers. The union, which has over 1.3 million members, said: “Bisexual people face particular issues at work. They can feel very isolated, experiencing stigma from both straight colleagues and lesbian and gay colleagues. In July, a Human Resources professional for the Ministry of Defence LGBT Network said that ‘B’ and ‘T’ still represent significant hurdles for full LGBT acceptance. More information about Bi Visibility Day can be found here.